In my previous post, I discussed tips on being your own wedding florist. 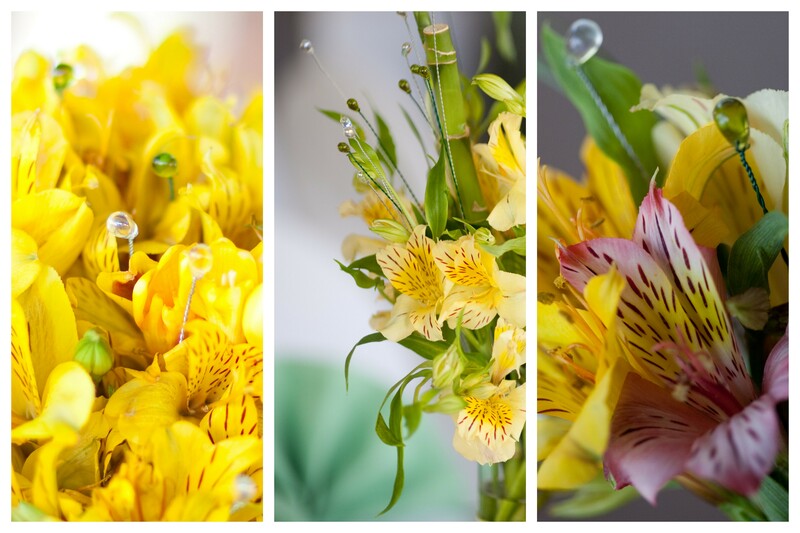 One of the key tips for creating a relatively stress free floral project is to restrict your flowers to one main choice. That’s not to say that your flowers won’t have any accompaniment. However, instead of companion flowers (which equals more money, time and potentially stress), I decided to use non-living decorative accents. These decorative beads on wires are a perfect accent. It’s a very affordable way to add a beautiful bit of elegance to floral arrangements, the wedding cake, and even the bride’s hair. Plus, by making it a DIY project, I was able to completely customize the look of the beads by selecting the color and shape I wanted. Cut the wires into sections (my sections were about 28″ long). Then thread a bead and fold the wire in half. Next, clamp the open ends to a sturdy surface, like a table end. Next, VrRrOoOoOM! It’s time for the power drill! Use it to twist the wire on itself. When you’re finished, you’ll notice a gap where the hook was, so…. Use the pliers to hold the twisted wire, and hand-twist the beaded end to eliminate the gap. VOILA! Beautiful beaded decor that’s ready to use. 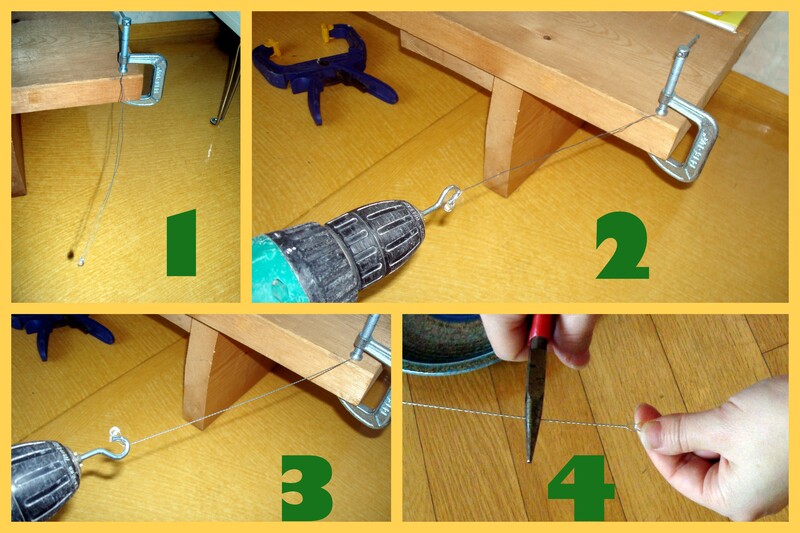 The wires can easily be cut or shaped/curled as needed. As you can see from the picture at the beginning of this post, I used these liberally in my wedding bouquet, table centerpieces and corsages/bouts. I also gave a handful of these to my baker to add to our wedding cake. 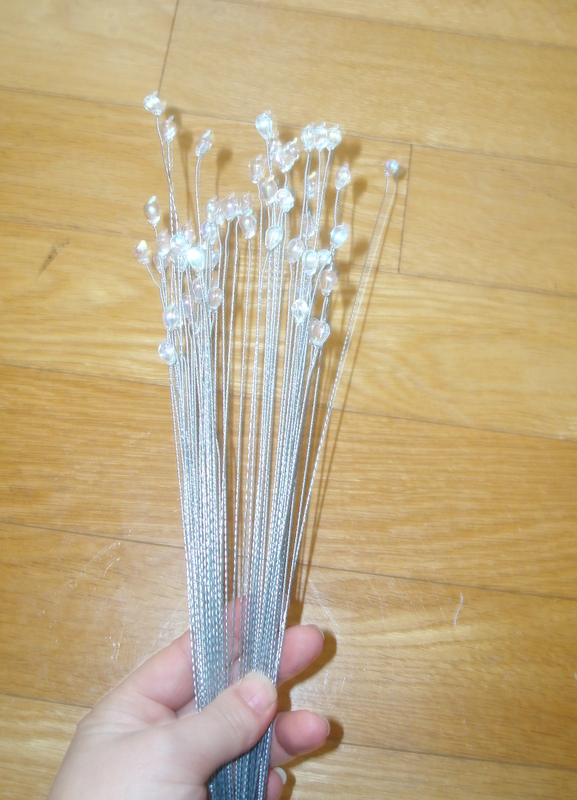 I’ve even seen wedding bouquets made entirely of these beaded wires, so if that suits your wedding style, then go for it!